A stone's throw from the sea, succumb to the charm of an exceptional panorama between the exotic garden and the vibrant personality of the old town. Our team welcomes you in a place of Belle Epoque charm, to make you live a moment out of time. 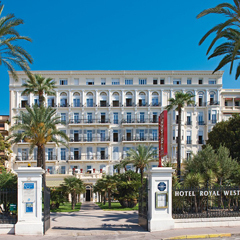 This three-star hotel enjoys a wonderful location on Menton's seafront promenade, with the sea stretching away to the horizon and only a five minute walk into the narrow streets of the old town – so cool and shady in summer! – where the spirit of French artist Jean Cocteau can still be felt. There's so much to see on the Côte d'Azur! Nice and its museums, Monaco with its luxury boutiques, and the Italian Riviera with its picturesque villages are all close by. n this 1870 Palace Belle Époque, one would think one would go back in time: to hear the horse-drawn carriages on the Promenade, the golden youth dancing foxtrot and charleston in the ballroom... Today, the Royal Westminster seduces with its refined comfort. The past splendours of this former Belle Epoque palace have given way to a warm and sociable atmosphere. This hotel offers a sumptuous setting for a holiday on the French Riviera where friendliness and conviviality are the order of the day. With its series of lounges and spacious rooms with wonderful views out to sea, over magnificent wooded gardens or over the heights of Menton, it's the perfect place to relax with a book or enjoy lunch on the terrace. Piano-bar evenings and dances form a congenial backdrop to catching up at the end of the day and sharing your discoveries. You may also enjoy staying at our other hotels on the Côte d’Azur, whether it be for the Carnival in Nice or to enjoy the gentle pace of life in Menton. This Belle Epoque Palace built in the 1870s gives you the impression of stepping back in time; you can almost hear the horse-drawn carriages along the Promenade and the bright young things dancing the Foxtrot or the Charleston in the ballroom. Nowadays, the memories of those glamorous times mingle harmoniously with artworks by 15 contemporary artists in a warm and convivial atmosphere that's ideal for enjoying a stay in the heart of the French Riviera. 92 rooms (3 of which can accommodate people with reduced mobility) modern and spacious, entirely renovated in bright shades that welcome from 1 to 4 people with sea view or city view, served by an elevator. Standard or Privilege rooms with sitting area and mini-refrigerator. Small animals (maximum 8kg) and non-hazardous pets allowed in addition: 14€/day/animal. With a dining room overlooking the gardens, "Le Westminster" offers fine regional dishes from a Chef who likes to add a few touches of Provençal and Italian cuisine. From May to September meals are served on the restaurant's terrace lunchtimes and evenings. Breakfast 7.15 - 10.30 a.m. Lunch noon - 2 p.m.
Breakfast served in your room to 11 a.m., Wine List and à la carte menu in the restaurant. Open from 10.30 am to 11pm. Evening ambience: musical evenings and events. Old Menton, its gardens and sunny promenade, the Oceanographic Museum and the Principality of Monaco, nearby Italy: San Remo and Dolce Acqua. NEW: Walking tour to discover the city in small groups. Take advantage of your stay in Menton to discover the nearby Italian Riviera: from Vintimille and its market to Bordighera, San Remo, Imperia. Surrounded by mountains bathed by the Mediterranean Sea, you can linger in the botanical gardens and medieval alleys. Bollywood, a name that sings about the happiness of living, a name for dreaming and making people dream... Monumental motifs, coloured flowerbeds, dances, songs, animations and a fabulous bestiary evoking Indian mythology! PROMO: 2 events are included in the price of 2 stays from 17/02 to 03/03/18. Nice Carnival:"The King of Space"
Illuminated corsos, parades, giant parades day and night, flower battles, 1,000 musicians and dancers from all over the world... Live the carnival 2018! May : the commedia dell'arte in the city! August : the Menton Music Festival and its eclectic programming. October: Colloquies Thinking Our Time. Conferences-debates every Saturday of the month. During your vacation on the French Riviera, the hotel's Kiosk advises you on current events and events and offers ticketing service for museums, parks, shows and outings. Cannes and the islands of Lérins, Nice, Vésubie and Mercantour. Italy nearby: the Italian Riviera, San Remo and Dolce Acqua. A8 Motorway to the Menton exit, then towards centre ville – the centre of town. At Casino, turn left after 200 m onto the seafront (Promenade du Soleil). Airport Express: Nice - Menton airport shuttle bus. Departures every hour. City tax and local tax: rate determined per person and per night, liable to be reviewed during the year depending on municipal regulations. The hotel does not have a private car park but guests enjoy preferential rates in a nearby public car park (St Roch car park, 200 m from the hotel). Options: full-board: 18€/night - Animals allowed: 14€/night. Lemon Festival: 2 events are included in the price of the 2 stays from 17/02 to 03/03/18. -20% for children from 2 to 11 years old. This benefit also applies to single-parent families. HALF-BOARD PACKAGE: Accommodation per night on a half-board basis (breakfast and dinner). Drinks not included.